Heterotopic Pain: What is it and why you need to know about it. Heterotopic pain (HP) is a phenomenon where the source of pain is not where you experience it, commonly called “referred pain”. HP can have several causes: diseased organ (e.g., a dysfunctional gall bladder) expressed through right shoulder blade pain, or dysfunctional infraspinatus (shoulder blade) muscle, expressed as deep shoulder joint pain and/or nerve like tingling sensations down the arm. Didn’t know about the gallbladder symptom? Many therapists will just mash away at the shoulder blade area while Yoga and Pilates teaches will strengthen the scapula stabilizers in an attempt to strengthen the area instead of asking, “Are you also experiencing nausea? A “Yes” maybe a gall bladder issue while “No” may equal muscle. And 4 different ones can refer to that exact spot! Have complaints of pain that shoots from the top of the foot into the big toe. It could be an L4-5 disc / nerve impingement or a trigger point at the top of the shin in the tibialis anterior. See what I mean? 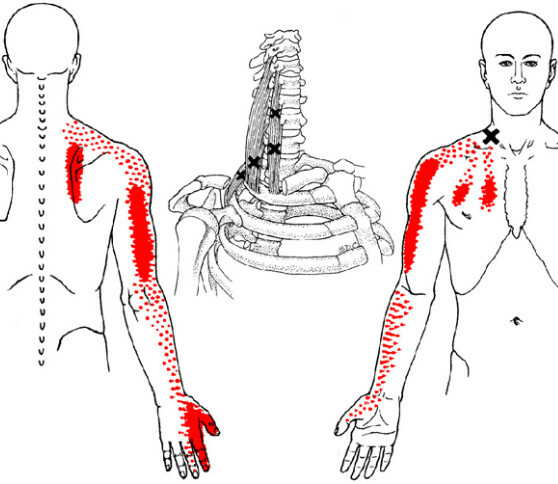 Lots of reasons for referred pain and muscle is overlooked and mistaken for other problems. Now what? If you read this far either you are a health info type person or maybe you have an ache or pain for a while that’s not going away. Drop me a line…let’s talk. Maybe I can direct you to more resources to read up or help with your issue. « IT Band Issue or a Dysfunctional Quadricep Causing Your Lateral Knee and Thigh Pain?